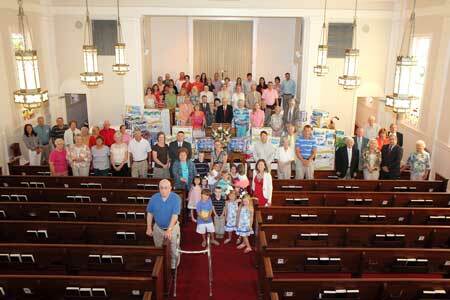 The Ridge Spring Congregation photographed during their response to a paper drive. Upon learning of the need for paper products in Lashmeet, West Virginia, Ridge Spring Baptist Church immediately offered their help. And here is their story as they told it. What started as an idea in a Sunday School Class, quickly spread to include the entire church and community. David Sawyer issued a challenge to all Sunday school classes to see who could collect the most paper products during the month of June. The Adult Men’s Class immediately met the challenge by purchasing 600 rolls of toilet tissue. Other classes participated by buying paper products and/or by collecting money. Vacation Bible School co-director Samantha McClure asked the children to bring toilet tissue each night of VBS for the West Virginia coal mining families. VBS children brought 327 rolls of toilet tissue and 52 packages of Band-Aids for cancer victims for Mae Ann Webb’s 2014 Miss South Carolina United States pageant. Sunday, July 6, Rev. Mayhew West presented a special program at Ridge Spring Baptist on The Shepherd’s Hands Mission in Lashmeet, West Virginia. At that time, the Sunday school classes assembled in the sanctuary, in front of the paper products to present the following items collected for The Shepherd’s Hands Mission:1500 double rolls of toilet tissue, 83 rolls paper towels, 22 boxes Kleenex, 1200 napkins, 1 40-ct. pkg antibacterial wipes. A total of $ 603.50 was collected to purchase school supplies for the children in the Lashmeet area schools. It costs about $10/bookbag for supplies. This will provide for at least 60 bookbag supplies. Jimmy Forrest has offered a truck and gasoline for the trip to transport these items. Wayne and Gloria Fulmer will make the trip to deliver them. Ridge Spring Baptist Church is so grateful to have been a part of this special ministry. A group of 14 young people left Ridge Spring on July 4 to travel to Peru on a mission trip. A special thank you to each person that contributed in any way to these mission opportunities. If you are looking for a church home, please join us. Rev. John Chambers is serving as interim pastor. The Shepherd’s Hands Mission operates on donations to help the poor folks in Lashmeet, West Virginia. These people are mostly very poor and very few jobs are available. What was once a thriving coal mining town is now almost a ghost town as the coal mines have closed due to environmental restrictions. Rev. Mayhew West & his wife, Marianne, residents of Saluda operate and direct the Mission in WV. Check their website: TheShepherdsHands.com for more information. To make donations or to volunteer, contact Mayhew West at 864-445-2221.